Three card poker is a popular casino table game. Since it is a variant of poker, you can easily learn to play this one if you are already familiar with the game of poker. Most of the casinos in the United States and many online casinos have started providing 3 card poker as a mandatory part of their table games. If you were looking forward to learning to play this game, this is your lucky day. This article tells you the easiest process, skills and strategy that you will ever need to play 3 Card Poker at any offline/online casino. The first thing you need to learn is the rules of the game. The 3 card poker game was first proposed by Derek Webb in 1994. He wanted to develop a game that has the excitement of poker and was as fast as regular casino games. Each hand consists of three cards, and so the ranking of cards and the odds are also different from a regular five-hand poker game. Also Read: How to Become An Expert In Video Poker? The rules for online three card poker game are almost the same as in a live casino, except for a few things. Instead of playing with real chips at a live casino, you deal in virtual credits and chips at the online casino. Free three card poker: Many online casinos will even let you play 3 card poker for free, which is a really good idea if you are looking to hone your skills. As we discussed above, the two basic options in this game are – Pair Plus and Ante-Play. 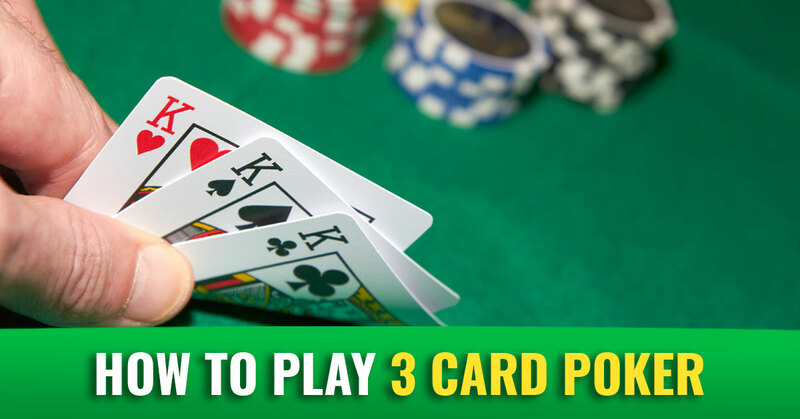 Following are the strategies to play 3 card poker with these options. In both online casinos and live casinos, a Pair Plus hand of three cards is treated as a win in the following situations. Since flushes have more probability than straights in a Pair Plus poker, they get you less payout. Some casinos also have an extra option, called mini-royal, at the top of the pay table, which consists of a combination of Ace, King and Queen of the same suit. There are four such possible hands. The biggest payouts are given to players who get a straight flush or three of a kind or a mini-royal. The basic payout is 1-1 which is given on a pair hand. A straight flush can give you as much as 40-1, while a three of a kind hand is usually paid 30-1. Mini royals are the highest paid hands. A 40-1 payoff means that you will receive 40 times the money you bet if you get a straight flush. As you can see in the table above, the probability of a player getting a winning hand in Pair Plus is around 1/4th (25.6 percent to be exact), which is still good enough since the payouts are quite high in this game. The best strategy in this game is to check the house edge before joining a particular Pair Plus pay table and to choose the tables with the most favourable odds. This is a bet on getting a better hand than the dealer. Here’s how it is played. The player is dealt three cards. After seeing his cards, the player can choose either to hold or to make a play bet equal to his ante. If the dealer doesn’t have a Queen or higher card to beat your bet, he won’t play and you win your ante with a 1-1 payoff. However, if the dealer has a Queen or higher card, he shall play and you will then have to beat him to win the bet. If you win, you get a 1-1 payoff on both your play bet and ante. If the dealer wins, you will lose both bets. The ante-play game paytable has almost the same hands with the same ranking as the pair plus. However, the hands without a pair or higher are usually ranked in order of the highest card, to compete against the dealer’s hand. For example, if you get a hand (without any pair or better) with the highest card better than the dealer’s highest card, you win the round. In the case, if your highest card is same as of the dealer, the second-highest card will be considered for the purpose of finding the winner. Bet only if you have a Q-6-4 or higher combination, or fold if you have lower than that. If you don’t have a pair but have an Ace or a King as high card, you should bet no matter what other two cards are. If your high card is lower or equal to a Jack, you should fold. Bet if you have a 7 or higher second card, irrespective of the third card. Bet if you have a 6 as second card and the third card is either a 4 or a 5. Fold if the second highest card is a 6 and the third card is either a 2 or 3. Fold if you get a 5 or lower second card, irrespective of the third card. Some casinos also pay a special ante bonus for every hand that has a straight flush, three of a kind or a straight. These bonuses should also be considered when determining the house edge in a particular game.